Some people just get it when it comes to children and Lale Ketcham is one of those people. Lale is our newest Rad Mom and the owner of Windy City Bebe, a super cool kids’ clothing and accessories store right here in Chicago (don’t worry, they sell online too!). This week, she gave us something special – the Holy Grail of snacks. Zelda lost it over the 3-Step Chocolate Banana Peanut Butter Bites and I was in awe of how much the Sour Patch Kids Grapes tasted like the real deal. Zelda was making the most delightful little faces as she ate them and continuously asked for more. Needless to say, we’ll be making these regularly. If you make the grapes, just be sure to slice them up into smaller pieces for younger babes! What snacks does your family flip over? The Holy Grail of kid-friendly snacks. For the Sour Patch Kids Grapes, wash the grapes and place them into a bowl (still wet). Coat the grapes in the sugar free lime jello fix, place into a sealed container and freeze for three hours. Remove from the freezer and serve to babes (they taste just like Sour Patch Kids!). 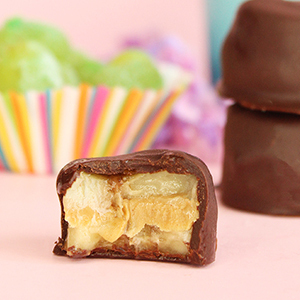 For the Chocolate Banana Peanut Butter Bites, slice the bananas into coins, places a dollop of peanut butter between two coins and freeze for one hour. Melt the bakers chocolate and Crisco together in the microwave (approximately one minute) and dip the bananas in the chocolate. Freeze for 3 hours and then serve to littles!